The HZMB has a dual 3-lane carriageway; the speed limit is 100km/h on the main bridge. As the bridge is mostly located in mainland waters, vehicles will keep to the right of the road. Cars can change to the left after having passed the boundary checkpoints in Hong Kong and Macao. Cross-boundary coaches via HZMB operate similarly to current coaches that run between the Chinese mainland and the two special administrative regions through existing ports, such as the Shenzhen Bay Port. The HZMB Authority will be in charge of the bridge toll. The toll is in Renminbi. There’s only one toll plaza with 20 toll gates, which is located near the Macao and Zhuhai ports on the mainland side. All toll gates will be available for auto-toll systems in Hong Kong and Guangdong province. Besides cash, bank cards and e-payment such as WeChat Pay and Alipay are all available. The Main Bridge located in mainland waters will be managed by the Hong Kong-Zhuhai-Macao Bridge Authority, which was jointly founded by the governments of Guangdong province, Hong Kong Special Administrative Region and Macao SAR in 2010. It is responsible for the construction, operation, maintenance and management of the Main Bridge. The Authority is located in Zhuhai. Meanwhile, there are monitoring centers and departments charged with responsibilities such as road rescue, maintenance and fire services, on the west and east artificial islands of the bridge, for daily operation, maintenance and emergencies. The ports in Hong Kong, Zhuhai and Macao will be open 24 hours daily. They are built and managed by local governments respectively. Zhuhai and Macao will cooperate to implement a one-off customs clearance in the two ports. The two cities will share immigration data, allowing travelers to finish the exit and entry process in one pass. HZMB is a 55-kilometer long bridge-island-tunnel complex across the Pearl River Estuary. It is the world’s longest sea crossing. The bridge consists of a 6.7-km undersea tunnel, which is the country’s first offshore immersed tunnel and the world’s longest immersed tunnel for road traffic. It is connected to the bridge through two offshore artificial islands. The tunnel is built to reserve room for a planned shipping channel for passenger liners with a displacement of 300,000 tons. As the planned location is close to the Hong Kong International Airport, where there is height limitation in the airspace, a tunnel must be built subsea instead of a bridge with tall towers. The plan to build a link road across the Pearl River Estuary was first initiated by Hong Kong industrialist Gordon Wu Ying-sheung in 1983. After several twists and turns, the Feasibility Study started in March 2004 under State Council’s approval. The study report was approved in October 2009, followed by a commencement ceremony on Dec 15 in the same year, chaired by then Vice-Premier Li Keqiang in Zhuhai. So far, the latest cost of HZMB is about 120 billion yuan (US$17.4 billion), of which the 29.6-km Main Bridge invested by three governments is about 48.1 billion yuan. The rest are investments by individual governments on their ports and link roads to the Main Bridge. The cost allocation among the three governments shown as above is settled by the assessment of economic benefits they can get after the bridge opens. The most important benefit is that the bridge will provide the east and west of the Pearl River Estuary with direct road connections, which can enormously facilitate the development of industries that rely on fast transportation, such as logistics, food and convention and exhibition. 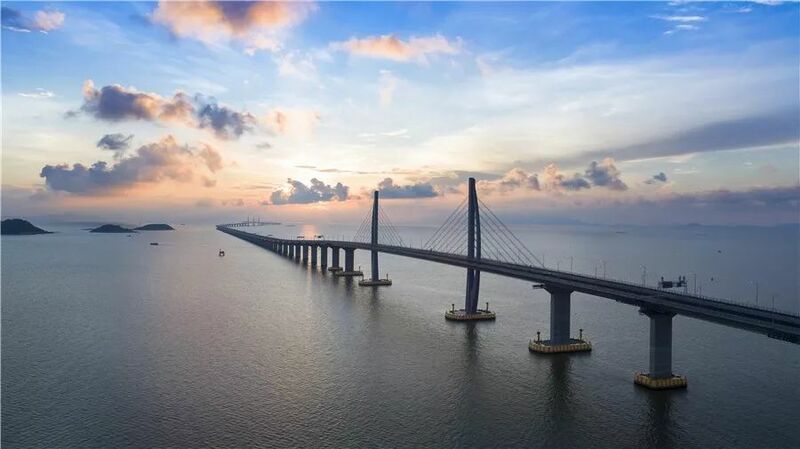 Looking toward the future of the Guangdong-Hong Kong-Macao Greater Bay Area, Liu Xiaodong, a major designer of HZMB, told China Daily that there will be five bridges across the Pearl River Estuary by around 2035, or one sea crossing every 20 kilometers parallelly. Future traffic demand was taken into account during the preliminary design for the bridge, back in 2003, Liu said. “You can’t expect one bridge to meet all needs,” Liu said. “HZMB may not carry the largest traffic volume; as the first sea crossing in the Pearl River Estuary, it will pave the way for the adjustment of industrial structure in the Bay Area,” he said. HZMB has also accumulated precious experience for similar projects in the future. The under-construction Shenzhen-Zhongshan Link is a perfect example. Based on technologies, marine data, talents and all the other experience from HZMB, the new link is also a bridge-island-tunnel complex, about 40 kilometers to the north of HZMB.